What is transactional legal work at large law firms? 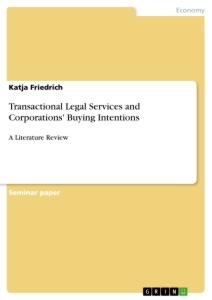 This literature review investigates factors influencing the choice and future buying intentions for transactional legal services at large law firms. In doing so, two marketing concepts, namely perceived service value and commitment (affective and calculative commitment) are integrated and their relationships examined. There are two parts to this literature review. Part 1 draws on the services marketing literature and reviews past research on legal services’ credence attributes, future buying intentions, perceived value and affective and calculative commitment with particular focus on professional services. This part serves to gain a better understanding of the conceptual elements more broadly that would otherwise have been dismissed. Part 2 discusses the results of the systematic literature review undertaken on future buying intentions/the choice of legal services and large law firms. The words “choice” and “future buying intentions” are used interchangeably, implying the equivalent meaning in this context. The systematic literature review was conducted in addition to Part 1 because very little academic research on legal services could be found. It served to further circumstantiate and identify elements that are relevant in the legal context. From my findings there are commonly scholars from four different academic disciplines who examine particular aspects of the legal industry, i.e. legal scholars, economists, marketing scholars and sociologists. While legal scholars frequently discuss and analyze the law and ethical aspects of lawyering (e.g. Lande, 2008), economists often focus on the growth of law firms and emphasize the asymmetry of information between customers ("principals") and service providers ("agents") (e.g. Gilson, 1990; Kim, 2009). Marketing scholars typically seek to understand particular constructs such as client-attorney relationships, satisfaction or service quality and identify choice criteria in determining the essence of particular constructs from a consumer’s and/or corporate client’s perspective (e.g. Hilton & Migdal, 2005). Sociologists on the other hand often study the legal profession (e.g. ethical concerns etc.) as a whole (e.g. Silver, 2000). Studies concerned with buying intentions in the legal context usually address the value of legal services in general, law firm growth and/or decision-making (e.g. Schwarcz, 2007; Wilkins, 2010). Prior empirical research that focuses on purchasing-decisions for transactional legal work at large law firms or legal work at law firms in general, is scant and mostly undertaken in the United States. Generally speaking, work at the large law firm can be divided into two broad areas: transactional legal work and litigation. Both, litigation and transactional legal work can be very broad and the services provided may vary from law firm to law firm. This review will focus on transactional legal work and more specifically, complex transactional legal work. Transactional lawyers work with clients on business transactions predominately outside of court. This includes drafting contracts and ensuring compliance with law across various practice areas. Depending on scope and specialization of the law firm, transactional legal work at a large law firm often ranges from mergers and acquisitions and corporate law matters such as increases and decreases in capital stock, contract negotiations, the execution and termination of intercompany agreements as well as the squeeze-out of minority shareholders, to real estate and financing matters as well as intellectual property advice (e.g. Silver, 2001). The strategic planning of transactions and the performance of due diligence reviews, negotiations and reporting of due diligence results often form an integral part of that work (e.g. Silver, 2001). Specifically, in this review, I am concerned with complex mergers and acquisitions transactional legal work, which will be referred to as “complex transactional legal work” in this review thereafter. To provide the reader with a better understanding of transactional legal work, among the largest legal transactions accompanied by large law firms in the German market in 2016 are the Vonovia acquisition of Deutsche Wohnen (over USD 15 bn), the investment of HeidelbergCement in Italcement (over USD 5 bn) as well as the acquisition of Elster by Honeywell (over USD 5 bn). A transaction usually requires the support of a number of different practice groups, i.e. areas of expertise and typically, in an acquisition of a company, one would expect to see the involvement of experts in the area of corporate law, finance, regulatory, employment, anti-trust, real estate and tax. While there seems to be a large body of knowledge on product purchasing and related purchasing process, much less academic literature can be found about services and their selection criteria from a corporate customer’s perspective. Several authors agree that the selection criteria and the decision-making process for goods are essentially different from those of services (e.g. Edget & Parkinson, 1993; Jackson et al, 1995; Axelsson & Wynstra, 2002). Services marketing, which has found its place in marketing textbooks since the 1990s (e.g. Grove et al, 2003), usually emphasizes four distinct characteristics that distinguish services from goods. The four characteristics that have commonly been cited are intangibility, heterogeneity (not standardized), inseparability (difficult to separate production from consumption) and perishability (difficult or impossible to store). It is this distinction that has helped shape the services marketing literature, led to differing selection criteria and to the development of distinctive marketing strategies for services and goods marketers. I acknowledge this differentiation and the debate on those characteristics in general and more recently, the appropriateness to generalize across a diverse range of services in particular (e.g. Lovelock & Gummesson, 2004; Edvardsson et al, 2005). However, I agree with Edvarsson et al (2005) in that it is perhaps no longer necessary, or even appropriate, to investigate whether goods differ from services in general, or whether these generic characteristics can be generalized across all services, given the diverse range of services that have sprung up over the past decade. From my experience in practice, these characteristics do not necessarily apply to transactional legal work. For instance, in terms of intangibility, transactional legal services can be highly tangible in that it may involve organizational restructurings resulting in reduced tax payments or operational cost changes only months after the transaction has been completed (e.g. Edvardsson et al, 2005). Similarly, the specialized knowledge applied in transactional legal work can, and is, partly stored by corporate clients (in form of contracts, due diligence reports and other documents) and can be partially reused in future transactions. An in-depth debate of these characteristics though is beyond the scope of this review. Rather, my starting point is in the realm of professional services, as a specific and particular form of the broader classification of ‘services’. Transactional legal services are classified as professional services, professions that are highly specialized and require a significant amount of training (e.g. Rosenbaum et al, 2006). This sets professional services apart from other services. As Rosenbaum et al (2006) note “Unlike other services, professional services are conceptualized as highly skilled services that require a provider to obtain a specialized formal education or a professional license.” (p. 117). As a result of that, selection criteria for professional services may not be commensurate with those of other services. This has also been noted by researchers in other disciplines. For instance, contributing to the literature of engineering economics, Kugyte and Sliburyte (2005) differentiate between professional services, service shops and generic services and note that service provider selection criteria depend on the type of services researched. As opposed to generic services, professional services for example require advice and trust from the buyers’ perspective due to insufficient information available and due to a higher level of perceived risk (e.g. Kugyte & Sliburyte, 2005). As a result, evaluating alternatives is much more complex and consequences in forming inappropriate decisions could be serious and expensive for a corporate client (e.g. Kugyte & Sliburyte, 2005). While their study looks at attorneys and consumers and the choice of legal services at law firms, this research is concerned with the choice of transactional legal services at large law firms from a corporate customer’s perspective and, intuitively, some criteria, such as “advertising in yellow pages” or “location is near home” seem inappropriate or suspect to consider in the context of large law firms and corporate clients. Other criteria that appear to be relevant to this review are missing. For instance, there is no indication of the law firm being the “trusted advisor”, which according to several authors plays a critical role in the context of professional services (e.g. Kugyte & Sliburyte, 2005). Furthermore, the study does not distinguish between the types of legal services offered and I suspect selection criteria and the importance of certain criteria may differ across different types of legal services, e.g. “billing methods” might not be critical in case of white collar crime. Focusing on individual consumers and corporate clients, Ellis and Watterson (2001) find that corporate clients are particularly influenced by the experience of a law firm, consisting of technical and interpersonal criteria (e.g. technical expertise, approachability, rapport etc.) and word-of-mouth in their choice of a law firm. While the authors find common reliance upon certain factors, they also conclude that significant differences between individual consumers and corporate clients do exist. Hilton and Migdal (2005) investigate factors that create client dependency upon lawyers and find that corporate clients are more likely to be dependent on their lawyers where: “speed of response is critical to their business; legal outcomes have a large impact on the well-being of their business; and where they have made significant relationship specific investments into the management of the relationship” (p. 161). All three studies formed part of the systematic literature review and important themes will be further discussed in Part 2 below. It is important to highlight that, while all three studies are concerned with the purchasing of legal services, none address potential differences in the factors arising with repeat purchasing. For instance, client-specific knowledge may not be essential in first time buying but understanding how an organization functions, their daily processes and knowing relevant individuals and their management approaches may be critical in repeat purchasing. Outright Monetary Transactions. Should the ECB intervene in the Eurocrisis by buying Bonds of Crisis Countries? EU Financial Transaction Tax. An Effective Means to Curb Speculation in Financial Markets?